Tullochgorum Lodge is a luxury three bedroom holiday home in the Cairngorms National Park, in the heart of the Scottish Highlands. Sitting on its own in half an acre of sheltered, secluded, south facing grounds, the Lodge enjoys magnificent panoramic views over the River Spey to the Cairngorm Mountains. The Lodge is located on a cattle farm eight miles north of Aviemore and two miles from both Boat of Garten and Nethy Bridge. It is welcoming, warm and cosy all year round due to its thick granite walls, double glazing, range cooker, open fire, wood burning stove and outdoor hot tub. Tullochgorum Lodge sleeps six in comfort and style. It's the perfect place for a family holiday, providing a relaxing, picturesque escape and a great base for exploring the Cairngorms and beyond. 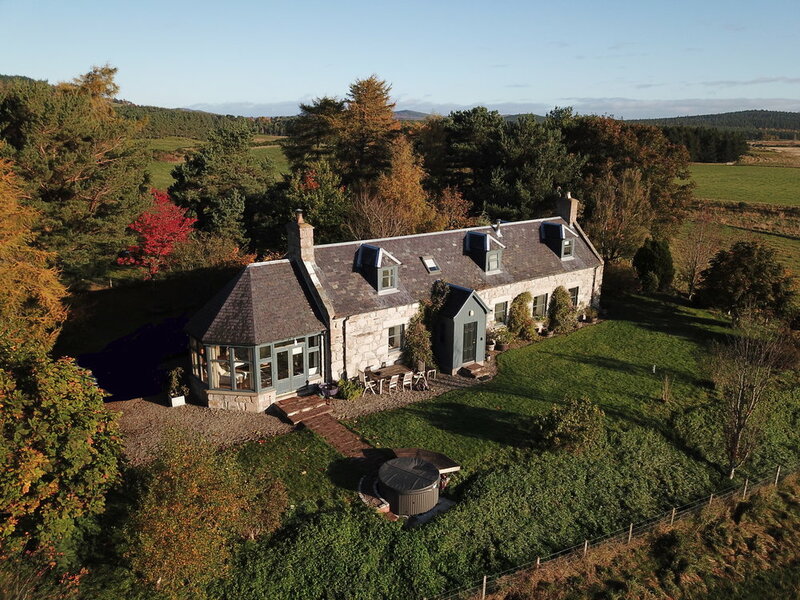 Tullochgorum Lodge sits in approximately half an acre of its own garden grounds, which offer stunning 360 degree panoramic views of the surrounding countryside. The lodge itself is a beautiful old building traditionally made from granite with a slate roof. It has been extensively refurbished, insulated, furnished and decorated to provide luxury, comfort, warmth and convenience. The front garden faces south over the River Spey towards the Cairngorm Mountains and includes a large area of lawn as well as a wide range of mature trees and flowering shrubs. The outdoor dining table has six chairs and is a beautiful, relaxing spot for breakfast, lunch and dinner. For al fresco cooking and dining there is a gas barbecue and a large outdoor charcoal barbecue which also doubles as a fire pit for after the sun goes down. The six seater hot tub is at the edge of the front garden to maximise the fabulous views. There is a non-slip path leading the short distance from the sun room to the tub. Robes and towels are provided for all guests. The back garden contains a large number of mature trees including apple trees, victoria plum trees and a cherry tree, as well as a herb garden. The grounds are very child friendly and are fully enclosed by a gate and fence. The garden is fully enclosed with a gate and fence. Next to the kitchen at the East end of the lodge, the lounge is a large, cosy, double aspect room with one window to the East and two to the South. There is seating for eight but this room can comfortably accommodate more if required. The lounge features an open fireplace (wood is provided free), a 50" flatscreen SMART 4K TV with Sky movies and sport, a blu-ray player with a selection of blu-ray discs and DVDs and a wireless Viso speaker for music. The fully fitted and equipped dining kitchen has granite work tops, oak flooring, a Rayburn range cooker, separate electric hob and oven, fridge freezer, dishwasher and microwave. The large dining table can comfortably seat eight. The snug, which is entered from the hallway, is a second cosy sitting room with a beautiful granite and slate fireplace housing a wood burning stove. It's a perfect place to enjoy a good book or just to get some peace and quiet. The snug now also features a 48" SMART HD TV so that different programmes or movies can be watched in both the lounge and snug. Two further doors lead from the snug to bedroom 3 and the sunroom. Because of its proximity to bedroom 3, the snug can also be used as a separate lounge area for this bedroom. The sunroom is at the west end of the house, to take advantage of the afternoon and evening sun. It's a lovely room all year round, with near floor to ceiling windows on three sides. The patio doors open out onto the short path to the hot tub, providing quick and easy access to the tub, which is particularly handy in the winter. The outdoor seating area is just to the left of the patio doors. The lodge has two bathrooms, both of which feature complementary soaps, shower/ bath gels and moisturisers from the Scottish Fine Soaps Company. Upstairs is the master bathroom, which serves bedrooms 1 and 2 and includes WC, basin, bath and walk-in shower. Downstairs is a shower room, which serves bedroom 3 and includes WC, basin and walk-in shower. Tullochgorum Lodge has three large bedrooms. Bedroom 1 upstairs is a double with kingsize bed. Bedrooms 2 and 3 (one upstairs and one downstairs) are set up with twin beds, which can be pushed together if required. A cot is also available in bedroom 1. All bed linen is high quality cotton, with Egyptian cotton sheets. Bedrooms 1 and 2 share the upstairs bathroom, while the downstairs shower room is handy for bedroom 3. The views from both upstairs bedrooms are wonderful, looking out over the River Spey to Abernethy Forest and the mountains beyond. The Cairngorms National Park, in the heart of the Scottish Highlands, is the largest national park in the UK. The Park contains five of Britain's six highest mountains as well as its biggest native forests, spectacularly clean rivers and lochs, moorland and farmland and a stronghold for Britain's wildlife. The Cairngorms is a mecca for outdoor people, with activities for all levels of experience. Choose from climbing, walking, horse riding, biking, skiing, golfing, fishing, rafting, canoeing and sailing, to name just a few. Cairngorm Mountain, Scotland's most popular ski resort, is less than a half hour drive from Tullochgorum. A visit to the mountain is a must, whatever the time of year. A funicular railway runs to the top station, just 400m from the summit, from where you can join a guided walk to the top of the mountain. Some of Scotland's most beautiful and challenging golf courses are within a short drive of Tullochgorum. Boat of Garten Golf Club, "the Gleneagles of the North", is about 3 minutes away and should not be missed by any keen golfer. Spey Valley has hosted numerous professional events and is less than 10 minutes away, as is the beautiful Grantown on Spey and the equally scenic 9 hole courses at Nethy Bridge and Carrbridge. The Cairngorms Golf Pass costs £20 and provides a 30% discount at all 12 courses in the Cairngorms National Park. Landmark Forest Adventure Park in Carrbridge is superb for kids (8 miles). Craggan Outdoors offers a huge range of outdoor activities for all ages and abilities (5 miles). Tennis courts can be hired at Boat of Garten Golf and Tennis Club (2 miles away). Learn to ski or snowboard with the Ski and Snowboard School near Aviemore, where you can also buy proper colour co-ordinated ski gear. Boat of Garten is a golfing gem - a great James Braid layout in a fabulous setting. Hire bikes from Cairngorms Bike and Hike in Boat of Garten, Mikes Bikes in Aviemore, or Base Camp Bikes in Grantown on Spey. Ben Macdui is the second highest mountain in the UK after Ben Nevis. The Boat of Garten community website contains lots of useful information on the local area, including what's on while you are there. The Cairngorms is rich in wildlife, with wildcats, pine martin and red squirrels in the forests, red deer on the moors, osprey fishing the lochs, and salmon and trout in the rivers. Boat of Garten is known as the Osprey Village and these magnificent birds can be seen nesting at the RSPB Osprey Centre at Loch Garten. You can see a lot of wildlife without having to leave the garden at Tullochgorum. Deer, brown hare, rabbits, pheasants, oystercatchers are regularly spotted. The garden contains a number of bird feeding stations, which attract a lot of wild birds. The woods in Glencarnie Estate, on the hill behind the lodge, contain a number of rare bird species, including capercaillie and large birds of prey. You can walk or cycle up through the woods directly from the lodge. The Cairngorm Reindeer Herd is Britain's only free ranging herd of reindeer and is highly recommended for a day out. The reindeer centre is located at Glenmore, just past Loch Morlich, to the east of Aviemore. You can see the reindeer in the paddock at the centre, or you can join one of the daily trips to where the herd lives on the mountain, where you can even help feed the reindeer. Another fantastic day out is to The Highland Wildlife Park at Kincraig, about 10 miles south of Aviemore. The Park is run by the Royal Zoological Society of Scotland, which is particularly concerned with conservation and protecting endangered species. The Park contains a reserve drive and a walk round area, including a cafe. They have polar bears and tigers as well as some of the more indigenous species. Cairngorm Mountain is less than a half hour drive from Tullochgorum. A visit to the mountain is a must, whatever the time of year. A funicular railway runs to the top station, just 400m from the summit, from where you can join a guided walk to the top of the mountain. The Strathspey Steam Railway makes daily trips between Broomhill Station ("Glenbogle Station" in the BBC TV series Monarch of the Glen) and Aviemore, stopping at Boat of Garten on the way. Broomhill Station is about 2 miles from Tullochgorum and the steam train runs right through Tullochgorum Farm close to the Cottage on its way to Boat of Garten and on to Aviemore. Landmark Forest Adventure Park at Carrbridge (6 miles away) is a brilliant day out for the kids. The Speyside Malt Whisky Trail covers more than half of Scotland's malt whisky distilleries, including Glenfiddich, Glenlivet and Cardhu, many of which are a short drive from Tullochgorum. They offer tours of the distilleries, most of which are free, and include a wee dram of the finished product. The stream train runs right past Tullochgorum, one field to the North.